Despite crores of rupees having been spent in name of tribal and other development programmes in one block of Palakkad district in Kerala, the region suffers from poor access to decent health care. 80 per cent of the adivasi population here are living in abject poverty. M Suchitra reports. The afternoon is hot. Pappa sits in the shade of a tree in front of her mud-thatched hut holding her baby close to her bosom. The child is groaning with high fever. Pappa is only thirty years, but looks much older. Thin with a pale face and tired eyes, she is an agricultural labourer, earning Rs 40-50 per day. She has five children. Ill and impoverished. A tribal mother and her child, Sholayur panchayat. Pic: T Mohandas. All the five times, Pappa delivered her baby at home. She worked until her labour pain reached its peak. When she felt that it was about time for the baby to come out she would stop work, get into the hut and squat in the dark dingy room. Then the expectant mother would hold on to the knotted rope that was hung from the ceiling for strength. Pappa delivered all her babies squatting. There had never been any one to attend to her during delivery. Each time, she cut the umbilical cord herself, bathed the baby herself and buried the afterbirth herself. "To stop the bleeding from the umbilical cord all you have to do is to pour some kerosene oil on it and then put some dough on it. If that isn't enough, you can also put some talcum powder," the mother of five says with all the assurance of a doctor. Asked why not go to a hospital for delivery, Pappa answers with another query. "Why should anyone go to hospital for delivery? They don't do things our way. You have to lie down to deliver your babies there!" In April 2006, M Suchitra was named the Development Journalist of the year at the Developing Asia Journalism awards, for this article in India Together. Click here to see more. This mother and her children belong to the Muduga tribe, and live in Varagampadi Ooru (a colony) in Sholayur Gram Panchayat in Attappadi block of Kerala's Palakkad district. They are are lucky. The proof is in the fact that they are alive. This is not a piece of luck that every adivasi mother and her children living in Sholayur as well as the other two gram panchayats -- Agali and Pudur -- have. It's true that Kerala claims to have attained a high Physical Quality of Life Index - as high as 80 - and has maternal and infant mortality rates much lower compared to that of other states in India. Ninety-nine percent of deliveries are institutionalised in the state. But statistics at the Community Health Centre at Agali, the block's headquarters, show a different picture. In the period between March 2003 and March 2004, there had been four deaths in the 603 births that had taken place. When 12 children die in every thousand births in mainstream Kerala, infant mortality including those stillborn is 66 for Attappadi. Eighty percent of the newborn babies are under the normal weight of 2.5 kgs. The real picture could be worse than the one statistics reveal. The large incidence of maternal and infant deaths are malnourishment, and this in turn is due to poverty, inefficiency and ineffectiveness of the health services provided by the government and the tribal people's inaccessibility to it. There are three government primary health centres (PHC), one community health centre (CHC) and 27 subcentres in this 745-sq kms block. But a large number of tribal women in this region prefer deliveries at home. The Bethany Tribal Mission Hospital, which functions near Anakkatty near Sholayur on the Kerala Tamilnadu border, reports 230-275 births in a year of which adivasi women account for only ten or twelve. These women are usually from the Irulas who could merge into the mainstream lifestyles. The Kurumbas who have not yet emerged out of the forests and the Mudugas who have still not adjusted to the life outside forests hardly ever come to the hospital. In the process of mainstreaming the tribal communities over the years, the tribe of traditional midwives has almost died out. The posts of gynaecologists and pediatricians remain vacant in many hospitals. A gynaecologist who joins a government hospital is entitled to a pay of Rs 8000 to Rs 10000. But private hospitals pay specialists anything from Rs 25000 to Rs 30000 when they sign-up. 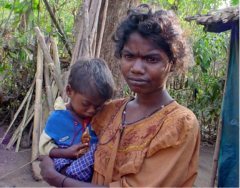 Even though adivasi women have the self-confidence to have their deliveries at home, childbirth in the absence of trained midwives often leads to tragedy. Cutting the umbilical cord with rusted knives or razor blades, tying stones to the end of the cord so that it falls off, tying up the cord with dirty bits of string, applying mud to stop the bleeding, leaving the mother dirty even when the child is cleaned up -- all these happen when inexperienced women help in the delivery process. To make the matters worse, many of the subcentres do not have ANMs (Auxiliary Nurse Midwife). All the subcentres are in isolated areas, and government nurses are scared to stay at these places alone. Most of the nurses, recruited from far away places, are hesitant to work in this remote and backward tribal belt, and they stay away from duties on continuous leave. The deserted sub-centres often become centres for gambling and drinking and even for brewing illicit liquor. The women are often unable to reach hospitals even if they want to. They have to walk over difficult hilly terrain for eight and ten kilometres before they can get hold of a vehicle. For adivasis who live in hamlets like Galasi, Thudukki, Moolagangal etc., in Attappadi block, even the community health centre at Agali is a distant world. "The tribal women, when they reach the hospital after a complicated delivery are very often in a critical condition," points out Dr Prabhudas, an Assistant Surgeon at the Primary Health Centre at Pudur. Dr Prabhudas has been working in Attappadi for the last 20 years. "As the facilities for attending a complicated delivery case are inadequate in the primary health centres and community health centre, we often refer them to a taluk hospital or district hospital." And to reach the Mannarghat Taluk Hospital from Agali, one has to travel two hours by bus. The district hospital at Palakkad is further one hour. There is nothing surprising about the fact that patients in critical condition mostly die on the way, says Dr Prabhudas. Even on reaching the government hospitals after a lot of effort, the adivasi women and children are not fortunate enough to be treated by specialists. The posts of gynaecologists and pediatricians remain vacant in most of these hospitals. Specialist doctors prefer private hospitals to government hospitals. A gynaecologist who joins a government hospital is entitled to a pay of Rs 8000 to Rs 10000. But private hospitals that charge hefty fees for abortions and caesareans are willing to pay much more. Specialists are paid anything from Rs 25000 to Rs 30000 when they sign-up. Naturally, doctors prefer private hospitals. Adivasi women who work as casual labourers do not have the financial wherewithal to get treated at private hospitals. "Earlier, at least graduate doctors used to show some interest in being posted to such remote areas, as such services entitled them to preference in admission to post-graduate courses. Now that the government stopped giving preference to remote area services during admission to post graduate courses, even graduate doctors are reluctant to work in remote and backward places like Attappadi," says Dr Prabhudas. Whether the deliveries take place at home or hospital, doctors point out that tribal mothers are not healthy enough to deliver healthy babies. Most pregnant women and lactating mothers hardly have enough for two square meals a day. "Almost all of them are terribly anaemic. Either they have sickle cell anaemia or anaemia from lack of proper diet. Most of them suffer from protein deficiency too. It is dangerous for a pregnant woman to have a haemoglobin count below ten. But most pregnant adivasi women have counts of seven or eight. It even goes down to five or six in some," says Dr. Muralidharan, the Medical Superintendent at the Bethany Tribal Mission Hospital. According to him, Eclampsia (high blood pressure and seizures) is very common in the third trimester in Attappadi's adivasi women. Their tragic tale started when the forest reached the hands of the government and the land around it, in the hands of the settlers. Earlier, when they lived in the forest their diet was a balanced one, consisting of tubers and fruits and meat. And they used to cultivate protein-and-iron-rich food like ragi, maize, pulses and chama. But later, during the influx of settlers, tribals were forced to retreat to the barren, parched, uncultivable hill-slops. Adivasi communities constituted 63% of Attappadi's population in 1961. According to the 2001 Census, the total population of Attappadi is 66,171 and Scheduled Tribes constitute 27,121. Adivasi population has come down to 41%. A survey report prepared as early as 1977 by a project officer at the state's Integrated Tribal Development Project reveals that the tribals had then lost 14,000 hectares of fertile land to settlers, and now 27,000-strong tribal people hold just 2,000 acres of land. A tribal family ifrom Pudur panchayat. Pic: T Mohandas. Most of the adivasi women shoulder the responsibility of raising the family on their own, while their men enslave themselves to liquor. The women have no option other than going back to their wage labour within a few days after delivery. Many of them suffer from acute and chronic back pain. Attappadi testifies how a mainstream development process could deeply shatter an erstwhile self-sustained community. It is the first block in Kerala where the Integrated Tribal Development Project (ITDP) was initiated by the state government. It had been declared an ITDP block in 1970 after the State Planning Board assessed it as the most backward block in the state. Ever since, the state government implemented a good number of special projects -- Attappadi Co-operative Farming Society, the Western Ghats Development Programme, the Attappadi Valley Irrigation Programme -- for the development of the block, and many other poverty alleviation programmes under the ITDP and Integrated Rural Development Project. According to the State Planning Board, during the Ninth Five Year Plan (1997-2002) Rs 13.28 crores have been spent in this block alone. Out of this amount 20% was spent in the health sector. A Rs 219-crore eco-restoration project (Attappadi Comprehensive Environmental Conservation and Wasteland Development Project) aided by the Japan government is being implanted in this area since 1996 through Attappadi Hills Area Development Society (AHADS), a state government agency. Yet, the region remains a symbol of backwardness with about 80 per cent of the tribal population living in abject poverty. None of the projects implemented here so far has taken the peculiarities of adivasi culture and beliefs into consideration. Even the much-hyped People's Planning Programme implemented in the state during 1997-2002 as the Ninth Five Year Plan turned out to be a failure in Attappadi since non-tribals constitute majority of the population, and also, due to the illiteracy (overall literacy rate of Attappadi is 49.5 per cent in sharp contrast with the totally-literate mainstream Kerala) and lack of political and administrative awareness of the adivasis. There are stark disparities in the healthcare services available to remote tribal regions compared to other parts of the state. Also, as Dr B Ekbal, national convenor of the Jan Swasthya Abhiyan (People's Health Movement) points out, there has been a definite decline in the public health care system in the state since the 1980s. Starting from the 1980s there was an overall drop in the rate of growth in government health expenditure due to a fiscal crisis. This was accentuated after 1991 as a result of economic liberalisation policies. In a study of the impact of macroeconomic adjustment policies on access to healthcare, Dr D Narayana of the Centre for Development Studies, Thiruvananthapuram, notes that between 1981-82 and 1997-98, the state's expenditure on medical and public health services, as a proportion of total expenditure, declined from 9.62% to 6.98%. Capital expenditure on medical and public health services, as a percentage of total capital expenditure, plunged from 9.61% to 1.57%. "As a result of this rolling back of government support to healthcare, the first major casualty has been the rural health sector," says Dr B Ekbal, "It's actually the lack of political commitment that has largely brought about a decline in the public healthcare system in Kerala. The state doesn't even have a health policy of its own. There has been no proper planning at the policy level. The government is spending more money on super speciality hospitals than focusing on the primary health care system." The State Health Department takes an indifferent attitude towards the health issues of the tribal communities. The last comprehensive survey in Kerala on the state of health and socio-economic status of the adivasis was carried out in 1992. Instead of seeking sustainable solutions to the problems faced by the tribal communities as a result of their alienation from land, forest and culture, what is being done is the distribution of free rice and iron tablets when starvation and anaemia become acute. When a good amount of money is being otherwise spent on development projects through the three-tier panchayats and the centrally-assisted welfare schemes, is providing basic healthcare services to the tribal communities that difficult? (Quest Features & Footage).